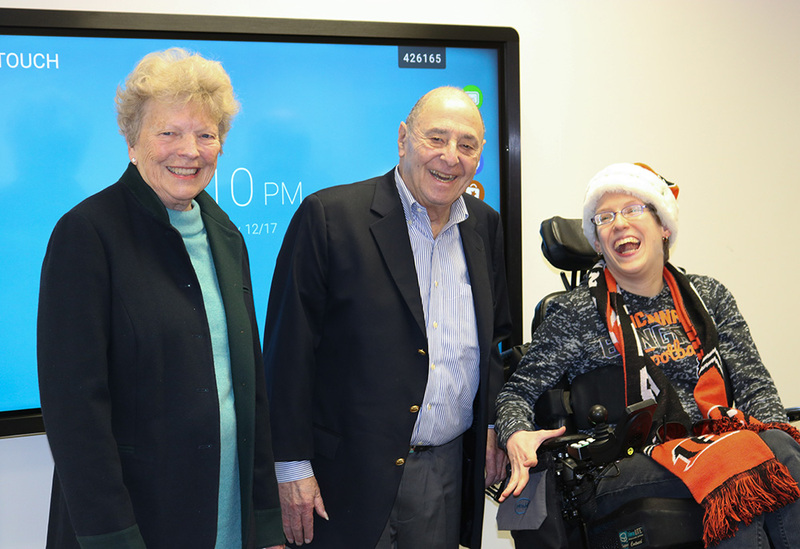 Gretchen and Robert Dinerman with Stepping Stones’ Adult Day program participant Jenny M.
On December 17, participants of Stepping Stones’ Adult Day Services received the gift of technology at a ceremony at our UCP Campus in Norwood. 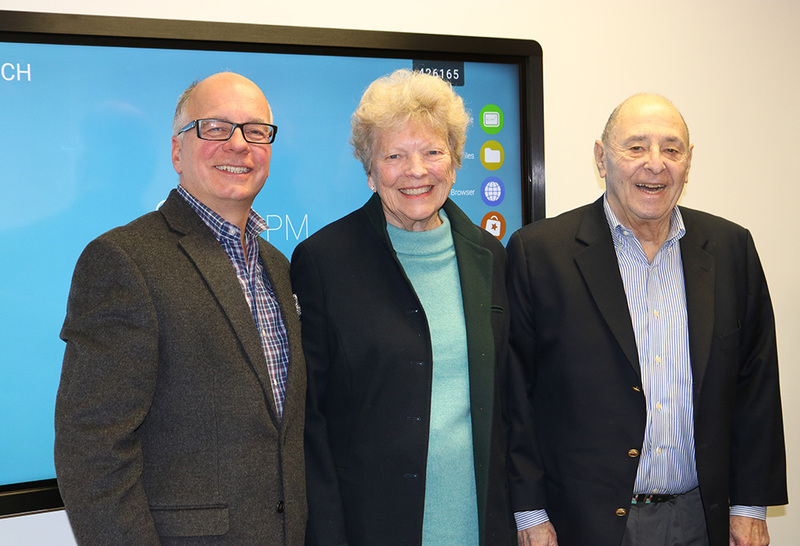 During the presentation, two new CleverTouch Pro smartboards were unveiled – a generous gift from the Margot Dinerman Gift of Hope program. Gretchen and Robert Dinerman established the giving tradition to honor the memory of their late daughter Margot. Margot had cerebral palsy and passed away long before advances in technology changed the lives of people with disabilities. She passed more than 4o years ago as a young teen who could not walk or speak. “Margot’s life could have been so different,” expressed Gretchen. Inspired by advances in adaptive technology, the Dinermans have been giving gifts of technology to children and adults with disabilities for now more than 20 years. The gifts are pieces of technology that Margot would have loved and benefited from. In recent years, individual participants of Stepping Stones have received personal gifts that include numerous iPods, adaptive styluses that can be used by hand or mouth, special headphones and more. The new CleverTouch smartboards introduce a whole new world of interactive programming that benefits our entire Adult Day program. Groups of adult and seniors with disabilities are now able to collaborate and work together in a variety of activities. 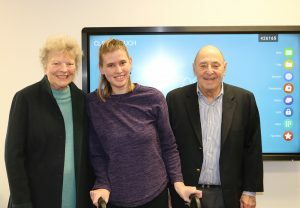 Margot and Robert Dinerman with Caroline and one of the two new CleverTouch smartboards. Stepping Stones’ executive director Chris Adams with Gretchen and Robert Dinerman at December 17th’s ceremony. 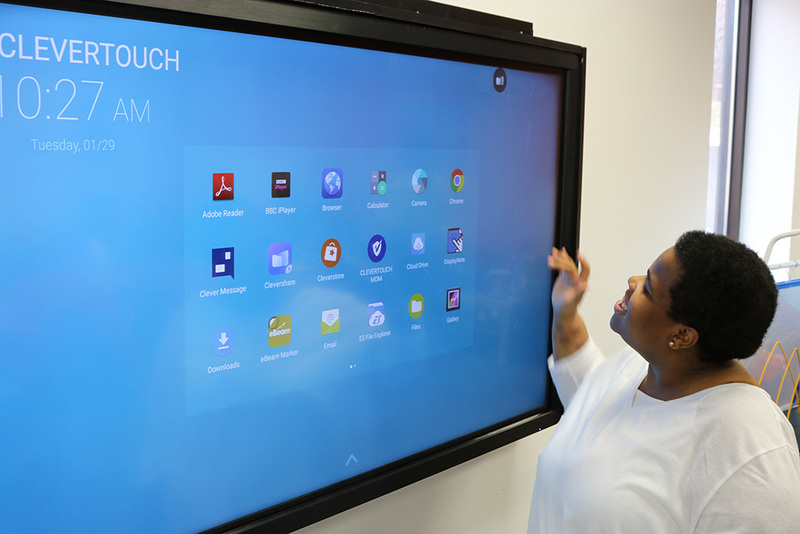 Mionca J. and her peers have been using the CleverTouch smartboards in a variety of new interactive program activities at our UCP Campus in Norwood.